This sidewall was designed by Elsbeth Kupferoth, one of the most prolific pattern designers of post-war Germany. Kupferoth got her start as a student at the Berlin Textile und Modeschüle. She studied at the school from 1937-1941, and it was there she was exposed to the work of faculty member Maria May, a successful pattern designer who is known for developing the spray-paint inspired aesthetic now referred to as Spritzdecor. After graduation Kupferoth created designs for textiles, plastics and wallpapers for large firms such as Pausa A.G., Rasch, Göppinger Kaliko and Marburger Tapetenfabrik. In 1956, she and her husband had become successful enough to start their own company, called Textilefirma Kupferoth-Drucke. Today, according to her website, the artist resides in Munich, where she focuses on the creation of large-format acrylic paintings. This sidewall, produced by Marburger Tapetenfabrik c. 1950-1956, is demonstrative of Kupferoth’s aptitude in creating the ‘contemporary’ abstract patterns that were a favorite of many mid-century German designers. 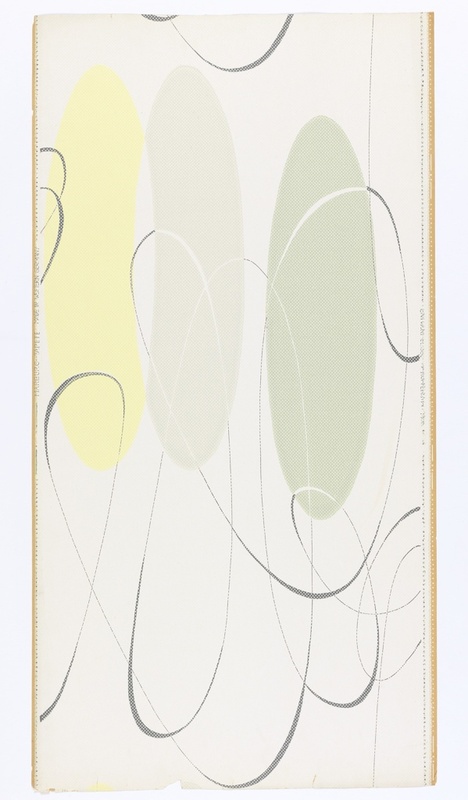 It features pale green and yellow ovals that stretch vertically down the panel, and scrawling, calligraphic loops. The loops change from black to white whenever they cross over an oval. The pattern is backed by an eggshell colored ground, and overprinted with white relief dots. This simple arrangement is quite masterful, utilizing a neutral colorway and textural dot-matrix to soften the ultra-modern, abstract pattern. Wallpapers of this aesthetic were popularly hung in new homes erected during the post-war building booms of Western Europe and the United States.